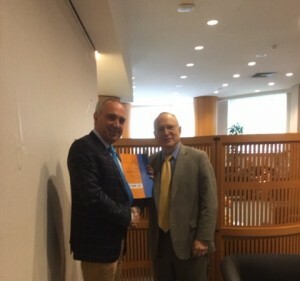 European Parliament Intergroup on Freedom of Religion or Belief & Religious Tolerance Co-President Peter van Dalen MEP, on behalf of the Intergroup, met with the United States Ambassador for Religious Freedom Rabbi Dr Saperstein in the European Parliament. Intergroup Co-President Peter van Dalen and Ambassador Rabbi Dr Saperstein previously met when the Intergroup visited Washington in September 2014 to meet with US government agencies and Congress to discuss freedom of religion or belief. At the meeting today, Peter van Dalen spoke about the Intergroup’s activities and the upgrading of the former Working Group to an Intergroup. Ambassador Saperstein was heartened by the upgrading to an Intergroup and the Parliament’s commitment to ensuring the European External Action Service promotes FoRB. The primary focus of the meeting was to discuss efforts to protect and promote freedom of religion or belief. Both agreed that economic development, through economic incentives, contribute to religious or belief tolerance and pluralism. However they stressed that the economic incentives need be balanced with human rights concerns. Ambassador Saperstein also touched on his recent visits to Iraq, Burma, Pakistan and Vietnam and the State Department’s latest Annual Report which covers 192 countries. The Annual Report is due to be released in the next six weeks. At the end of the meeting Peter van Dalen gave Ambassador Saperstein the Intergroup’s Annual Report on Freedom of Religion or Belief and spoke about the event held in the European Parliament in collaboration with the United States Commission on International Religious Freedom.